"One day you are preeminent, respected by all — a minister, a general, maybe even a prince. But what will you be tomorrow?" F.W. Murnau's films stand at the pinnacle of the silent cinema, and they remain necessary viewing for anyone seriously interested in film, much less silent film. The DVD era has seen his work get increasingly lavish exposure, with UK label Masters of Cinema and American specialist label Flicker Alley, not to mention Kino, all producing high quality editions of the master director's works. 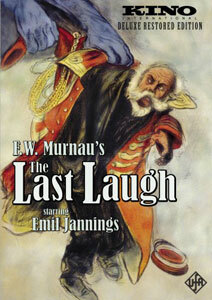 The latest Murnau to see an expanded release is 1924's The Last Laugh (aka Der Letze Mann, literally, the last man). Masters of Cinema released an R2 disc featuring the restoration used here, so some diehard collectors will already have the major contents of this disc, but for anyone else, it's a great improvement on Kino's previous disc, which has been thrown in here as well as a bonus second disc (carrying as it does the export version of the film, as opposed to the original German version). Emil Jannings plays the doorman at a ritzy hotel, where he glories in his opulent uniform and standing among his neighbors in the rundown area he and his niece live in. His age brings about the most nightmarish possible turn of events for the doorman when he is demoted to men's room attendant after it is determined that he can no longer hack the physicality of the job. He goes from respected to the target of everyone's contempt overnight, but as fate would have it, things may not end so badly. First and foremost, The Last Laugh is first and foremost about being a film; the plot, such as it is, is less interesting than what Murnau does technically to illustrate that plot. It remains renowned because of the techniques Murnau and cameraman Karl Freund used to show the disntegration of the doorman's life and mental state. Indeed, Murnau firmly believed that film could portray a story without the need for intertitles, and aside from the opening titles text and the lead-in to the finale, it is intertitle free. Much has been made of the ending, in which the despair of the previous events lifts thanks to the most ridiculous of contrived plot devices. To view the film seriously at all I think one must take this portion as yet another exercise in what "film" is all about; Murnau's tale of despair and hopelessness was derided by studio execs as being too depressing for audiences who didn't care about some anonymous elderly guy in the first place; hence, we get a feel-good ending that is completely at odds with everything we've seen up to that point. It is as if Murnau is saying to us, my storytelling techniques are merely one form of manipulation; here is another. As a result, it's almost as depressing as the ending we should have gotten. Image Transfer Review: With films from the silent era, one doesn't expect miracles, and we can always be appreciative when we get a great-looking presentation of a film. This restoration of the The Last Laugh looks quite good indeed, with only the minor blemishes endemic to the age and condition of the film, and those are minor indeed. Audio Transfer Review: The original score by Guiseppe Becce is paired with the original German version of the film, and it's superb. You have the choice of Dolby 5.1 or 2.0 to pick from, and both are very fine, with no appreciable defects I could hear. Extras Review: Of primary interest is a documentary about the film and its restoration (40m:34s), which takes a fascinating tour through the making of the movie, providing plenty of technical detail. Very much worth your time. Also included is a brief image gallery and the German title sequences, provided as is. Not sure why you'd want to watch these divorced from the film, but here they are. Finally, the second disc contains the original export version, which had been a previous release of Kino's, and you can read dOc's review of that disc here. If you already own the disc, you now have a spare; if you don't own it, it's a nice compliment if you like to make comparisons and study the alternate versions. A landmark silent film, The Last Laugh gets a jazzed-up release from Kino, who have the restored German version to go with the original export version as a bonus disc. An excellent documentary adds to the appreciation of this Murnau masterpiece.